The Crazy House quilt block is a five patch block but is actually pieced as an uneven nine patch, just for the ease of construction. 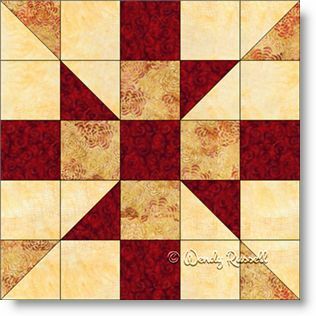 This quilt block contains only squares and half square triangles, making it an easy one to make, as long as care is taken in the precision of your seam allowances. The two sample quilts illustrated show just how different this quilt can be from another, simply by the different setting used -- whether as a straight set, or on point. It's all in your hands.